Mystical freshman from a far away state. Follow me on Strava for a daily French lesson! 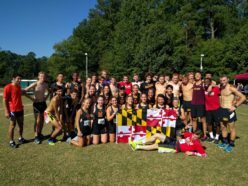 Hello past, present, and future Maryland Club Runners if you’ve made it this far congratulations either Briggs forced you onto his spiffy new website or you’re so dedicated you dug deep enough to find the blog. Regardless you’ve managed to find something super special… my first ever blog post!!! So sit back and relax as I take you through my top 4 tips for freshmen Terp Runners! 1. North by Northwest, Cherry Chill, Riverdale, which running route do I take? Look I’ll be frank with you College Park may not seem like the best place to run, but in all honesty it’s not half bad. If all you’ve done for 4 years was jog around campus that’s your loss. There are miles of trails where you can go up hills, run around lakes, and even long run down to D.C. Whatever you choose to do just remember every Thursday, 4-7, is the Riverdale farmers market, hey food detours are always acceptable in my book. Like me maybe you got your dinning plan and said why would I need 6 guest passes I don’t know a single upperclassman at Maryland. That my friend is where you’ve gone wrong, guest passes are an invaluable commodity. Oh you’ve perfected the left hand swipe you say! The left hand swipe may often be seen as cold and disconnected instead show your favorite upperclassman some love and maybe tomorrows workout won’t be so hard. 3.What is Briggs’s real name? I’m going to be honest with you… I don’t know. If you can figure out the real story behind why he’s called Briggs please let me know it’s been 6 weeks and all I’ve gotten is some story about a Trey sized bear and perpetually being known as a freshman. 4. Should I race? 8k’s/6k’s seem hard and why waste a perfectly good Saturday on running? Should you? is this even a question of course you should! Okay to be fair we all know that feeling when you show up to a meet with the immense pressure of 2 coaches and an entire team on your shoulders. Well you’re on the club team now the only pressure should be to win the free candy bars the top 10 runners get. Maybe the heat got to you today and you couldn’t quite crack the top 10 never fear someone is always down for chipotle where you can celebrate that new Pr with a burrito bowl and the brand new chipotle queso. On another note if your race was in the state of Virginia that’s a prize unto itself. Well there it is my first ever blog post! Hope you learned something because at the time of it’s posting this is officially a top 6 blog post. Have great evening and keep on running! Your favorite freshman from Virginia!